The wolf opened its long jaws. Rows of teeth stretching for her. I am the only one left to fight, so now, I must kill you. Scarlett March lives to hunt the Fenris – the werewolves that took her eye when she was defending her sister Rosie from a brutal attack. Armed with a razor-sharp hatchet and blood-red cloak, Scarlett is an expert at luring and slaying the wolves. She’s determined to protect other young girls from a grisly death, and her raging heart will not rest until every single wolf is dead. Rosie March once felt her bond with her sister was unbreakable. Owing Scarlett her life, Rosie hunts fiercely alongside her. Now Rosie dreams of a life beyond the wolves and finds herself drawn to Silas, a young woodsman who is deadly with an ax – but loving him means betraying her sister and has the potential to destroy all they’ve worked for. Scarlett and Rosie are sisters, so close that they believe they are two people sharing the same heart. They've grown up taking care of each other after a Fenris slaughtered their grandmother and disfigured Scarlett as she was trying to save her little sister from that same fate. Ever since then, the girls have dedicated their lives to fighting the Fenris. Now, though, with the return of their friend Silas from a year-long vacation in San Francisco, Rosie is starting to yearn for things she knows her sister would never approve of, that she could never ask for - because she is still trying to pay her sister back for saving her life on that horrible night. As Scarlet, Rosie, and Silas work ever harder to fight the Fenris in the city, Rosie is also fighting her growing feelings for Silas. Is fighting the Fenris really what she wants to do with her life? And is she willing to betray her sister for a chance at love? I had heard a lot of good things about Sisters Red before reading it, but I never dreamed that I would agree with them so adamantly! Jackson Pearce took the premise of the age-old tale, Little Red Riding Hood, captured its essence, and created her own, unique take on it. Successful, entertaining updates such as this (and even Dust City by Robert Paul Weston) are among my favorite books to read, and Jackson Pearce has just become one of my must-read authors. 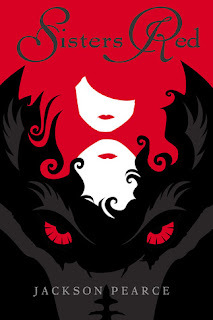 The blend of classic fairy tale, danger, intrigue, and forbidden love makes this an unputdownable read. This book has something for readers at every end of the spectrum, from romantics to die-hard Buffy fans. If you haven't yet, go grab a copy of this book! I promise it's worth it. The second book in the Sisters Red series, Sweetly, will be released in August '11. Jackson Pearce is also the author of As You Wish, already in stores.